← Wilkommen to Cabaret, Emma Stone! Picture a fight you have with someone and how it can go ten different ways. If you had only said something different or used a different tone of voice, you may have ended up with an entirely different outcome…or not. This is exactly what Nick Payne’s Constellations explores. Not just the concept, though; the 70-minute play examines the actual possibilities, the numerous pathways two characters can take in their relationship – all the potential ways a conversation can go when they first meet at a BBQ, when they consider spending the night together, when they’re faced with life-altering events. Jake Gyllenhaal as Roland and (Golden Globe Winner!) Ruth Wilson as Marianne give wonderfully warm, generous, and connected performances. Watching this play is like being in an acting class with them because they’re playing these scenes over and over with a new interpretation each time. It’s all about tactics. When an actor approaches a scene, he or she has to figure out a) what do I want? and b) how am I going to get it? That’s what these two are doing in real time. They do eventually shift out of a certain scene and into another as they move forward in time (or do they? ), but even when they’re saying the exact same words as the time before, it’s still fresh. And I believed them each time. The audience adapts to the new circumstances just as quickly as the characters do, and that is a testament to the writing. When I go down the rabbit hole of thinking about other universes and how many lives I might be leading elsewhere, I start to get dizzy. The play asks questions like: do we have control over our fate? Does free will exist if we are just one version of ourselves and all the other “choices” we could make are simply playing out in another universe? And what about time itself? Are the past and future merely fabrications, only kept alive in our own minds? 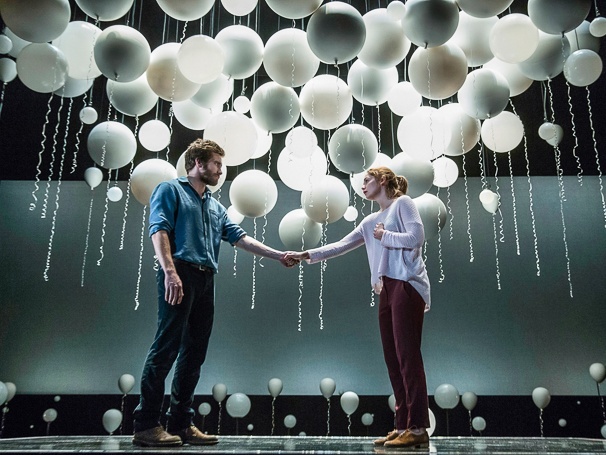 There is an element of the play building on itself – the sound and lighting designs (both enticing) growing more intense and cutting – as things develop and the story(ies) become more clear. I did think, however, that it was building to something, and I don’t know if that something ever arrived. Should there be a catharsis of some kind? Is there an ending? How can there be an ending when there are over 50 stories potentially being told? Because of this, the play as a whole feels somewhat incomplete. Unfinished even. But maybe that’s exactly the point. Sounds like a great Star Trek episode. I’m going to have to keep this one in my back pocket for when it departs and rights become available.